And so, one of the worst kept secrets in football, is finally confirmed. Manuel Pellegrini will be the new coach of Manchester City after agreeing a 3 year deal at the club. Actually, there’s little point discussing anything else, is there? Following the endless speculation, the conjecture and the fall out from Mancini’s dismissal, Pellegrini has eventually been confirmed as the Italian’s successor. Given the prolonged nature of this appointment, everything that needs to be said already has been said. Pellegrini failed at Real Madrid after spending over £200m, didn’t he? He’s only ever won one trophy in Europe and that was the Intertoto cup back in 2004. What “success” he enjoyed at Malaga and Villarreal was built upon the back of considerable spending. And look at the financial mess both clubs are in now. Sadly, we cannot all write for the mainstream tabloids. Some of us actually watch European football and delve a little deeper than the mere production of superficial nonsense designed to illicit a response and sell copy. Leaving aside the appointment of Pellegrini for a moment, the critics will argue about the supposed long term plan at City. Is this really evidence of a plan? The lavish spending (thus far) of over £40million on two players? This isn’t the future that UEFA had in mind when designing Financial Fair Play. It’s just more of the same from Manchester City and nothing new. This isn’t a brave new world – it’s just window dressing to cover the lack of progress the club is making. Very expensive window dressing. A side in the north of England attempting to mimic a club on the coast of Spain ? This is an ego trip fuelled by the extravagance of owners whose wealth knows no bounds. This is vanity, which is how a number in the media may interpret it, poised to print the pre-written obituary of Pellegrini and others when the bricks come tumbling down. And the bricks may well come tumbling down but that should not disguise the clear strategy that Man City has and which they are following. The comparisons with Spain (and ultimately Barcelona) are inevitable when City have appointed men like Ferran Soriano Compte and Aitor ‘Txiki’ Begiristain Mujik, both of whom are previous employees of the Catalan side. Begiristain was the man responsible for the appointment of Josep Guardiola as the new Coach of Barcelona back in 2008 when others on the Board felt Mourinho was a better fit for the side. In attempting to construct a new philosophy at the club, it’s unavoidable to an extent that you will turn to men who had helped you in the past and who share your vision. That’s why City was interested, along with other elite sides, of appointing Guardiola as their new Coach. When it was confirmed that Guardiola would move elsewhere, City needed an alternative. Somebody who would fit with their vision for the club over the longer term and who would mould the side on the pitch accordingly. It was no surprise that Begiristain returned to La Liga nor was it that surprising that Pellegrini was his chosen candidate. The club now aim to install a possession based, attacking game across the board. Each level of the club will follow the same model. The ultimate goal is to be both successful and to complement the first team with players developed by the club. Manual Pellegrini has been tasked with the early stages of construction. He is highly unlikely to be around once construction is complete but the stage from initial project inception to laying the foundations correctly can often be the most difficult aspect. A graduate of the University of Santiago in Civil Engineering, the Chilean began his coaching career in his homeland in 1988 with spells in Ecuador and Argentina following before Villarreal came calling in 2004. Pellegrini won his first and only piece of silverware in European football during his debut season with the successful defence of the Intertoto Cup. The yellow submarine also finished 3rd in the league and progressed to the quarter finals of the UEFA Cup. The following season would witness Villarreal reaching the semi final of the Champions League. Riquelme’s missed penalty late in the second leg enabled Arsenal to progress to the final via a 1-0 aggregate win. This remains the furthest stage a team debuting in the competition has reached. Domestically, the high point for the Chilean arrived in 2007/08 when Villarreal finished second to Real Madrid in La Liga. Villarreal remain the last side to split the big two in Spain , an accomplishment which should not be degraded. In a country where finishing third will earn you less TV income than a side being relegated from the Premiership, the financial disparity between the big two and the remainder should not be underestimated. The gap was bridged and that too by the production of stylish football. Yet this relative “success” was built upon the back of President Roig’s generosity. When things went bad, Pellegrini – who had overseen the good times – had long since abandoned ship. Right? Roig’s business began encountering financial problems at the onset of the recession, with the housing crash in Spain causing particular problems. This forced Villarreal to begin following a new financial model. Pellegrini had long since gone by the time of their relegation. As for the spending, Pellegrini’s net spend at Villarreal was just £11million. At Malaga , he arrived to oversee a new project being built upon Middle Eastern riches. Except the money tap was quickly switched off and Malaga endured a series of financial problems which required the offloading of numerous players whilst others waited for wages. The Engineer repaired the team to ensure progression to the quarter finals of the Champions League (the second furthest stage a team debuting in the competition has reached) and a 6th placed league finish. Pellegrini’s net spend at Malaga was just £16million. When the left back Monreal was sold to Arsenal in the winter transfer window and with the alternative left back Eliseu injured, the club acquired Antunes on loan from Pacos in Portugal . A new component for the team who fitted in seamlessly. It’s not about the money he has to spend. It’s about the qualities of the players both on and off the pitch. Pellegrini has used a variety of tactical set ups during his time at Villarreal, Madrid and Malaga, ranging from 4-3-1-2 to 4-4-2 to 4-2-3-1. But it has been with his 4-4-2 at both Villarreal and Malaga that his sides have often produced the best football. That may sound unusual given how we are constantly told the 4-4-2 is an entirely reactive formation, not to say an almost redundant formation at the top level, yet Pellegrini has it operating in the latter stages of the Champions League. How? Pellegrini has always used a flat back four. The defensive unit is always well marshalled by a dominant centre half. When an opponent attacks, the defensive line, which is normally high, will drop off to the edge of the penalty area before holding firm. The offside trap is used to good effect. At Villarreal the central defensive pairing of Godin and Gonzalo were physically robust and the full backs of Javi Venta and Capdevila able to move up and down the wings. The two defensive midfield players stay deep to offer protection and to pull wide should the opposition attack behind either full back. This provides security but is not entirely defensive. The players must also be able to build and construct play. At Villarreal, Marcos Senna was tasked with this role. The two wide midfield players cut in centrally to form a block of four in the centre of the pitch with the full backs advancing to provide the width. They move into the interior, hence the name “interiores”. Crucially, the two wide players must return to position for defensive duties. The two forward players meanwhile are capable of pulling wide, creating space centrally which can be attacked. Pellegrini was able to use the mobility of either Giuseppe Rossi or Nihat alongside the presence of a more powerful, physical striker such as Joseba Llorente. The key point throughout is the availability of passing triangles. From the graphic above, when players move, you can clearly see how passing channels are open via movement. A player always has passing options available to him and the side swamp the opponent in central midfield. In such a tightly congested area, the side with the greater technical proficiency will domainate as they find team mates with short, sharp passes. This will be a Pellegrini side. The positions are not fixed either. The right interiore will move across if play is stationed wide on the left (and vice versa). The team is compact and the opponent is squeezed. Eliseu on the left of midfield is a converted left back and operated more like a wing back, shuttling up and down. On the right, Isco would drive in centrally allowing the full back to overlap. Together, they would combine with Joaquin who was the striker but was beginning in a deeper position. 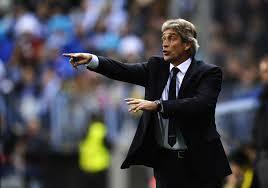 Pellegrini is not a coach who will instruct his side to press high and chase and harass an opponent. The Villarreal side had a South American feel to it with the tempo which they played the game and the individual components of the side. The side don’t rush to attack. It is structured, cautious, with the team moving as a coherent unit. His sides can defend resolutely as the performances in Europe of both Villarreal and Malaga demonstrated when a reactive approach was favoured allowing opponents to take the initiative. If that’s how he operated previously, how he will operate at City remains to be seen, particularly when it appears he has been charged with implementing a 4-3-3. With his ability to utilise the creative talents of a playmaker, David Silva could find himself in a central role in the season ahead. Silva is not the quickest player in physical terms but that will not dissuade Pellegrini from constructing the side around his creative talents if necessary. Using full backs for width is something which City have done to date. It’s also something that has become something of an Achilles heel for them with teams exploiting the space on transitions particularly given Barry’s immobility and reluctance to be pulled wide to cover. This is an area which must be tackled. Using two defensive midfield players will assist this but possibly not Yaya Toure. Indeed, how the Ivorian fits into the system will be a crucial element. Does he have the discipline to operate in a purely defensive fashion? Does that suit his talent best? The defence should be straightforward with Kompany the ideal individual to use as the central starting block. Alongside him may be Nastasic with Zabaleta and Clichy as full backs. In midfield, the three could be Fernandinho, Toure and Silva. City continue to be linked with Isco from Malaga and it’s not inconceivable to field an attacking trio of Isco, Silva and Navas behind Aguero as the central striker. Such a set up would provide an asymetrical formation with width on the right against narrow approach on the left and it would also need to combat the lack of defensive cover that Navas offers. Whatever formation is utilised, expect City to be more resolute defensively and more fluid in the attacking third. There will be a clear template to use when defending and flexibility when attacking. Questions will remain over the long term futures of the likes of Milner, Barry, Sinclair, Rodwell, Tevez and Dzeko. An already small English core may be depleted further. Actually, it is a real possiblity that the only Englishman that City will field on a regular basis next season will be Joe Hart in goal. Such a scenario is not City’ s problem in the short term at least, but it again raises questions over the technical and tactical profiency of English players. The manner in which Mancini departed to be replaced by Pellegrini would be very familiar to the Chilean. A little too familiar perhaps. Similar circumstances prevailed back in 2010 when Pellegrini departed Real Madrid after just one season to be replaced by Jose Mourinho. Pellegrini spent one season at Madrid when he spent a small fortune and achieved the princely sum of zero. Or so the story goes. Scratch a little deeper than your average tabloid journalist and you’ll find the real story. When Pellegrini arrived at Madrid , over £200m was already spent and in some respects he was already living on borrowed time. He had no say in the players that were acquired by the club. What he did have a say in was the players he would like to retain and build his side around. Players such as Arjen Robben and Welsey Sneijder. Two players who were subsequently sold within days of Pellegrini arriving against his will. The squad was unbalanced for the tasks ahead yet his viewpoint was ignored. And for those who would argue if he had won trophies, he would not have been dismissed, consider exhibit A; Vicente del Bosque. Sacked after delivering two La Liga titles and two Champions Leagues in just three seasons. Pellegrini was the choice of the former Sporting Director, Jorge Valdano, a man who has clear identity when it comes to football. According to Valdano, Pellegrini was a “protagonist; he seeks to dominate possession and always attack”. Perez simply wanted a manager who would win and Pellegrini was not a “winner” but nor was Perez either. He had overseen the collection of zero trophies during his reign as President. Pellegrini was not Perez choice and favoured some players acquired by the previous President. It really was that petty at times. Madrid spent £258 million prior to Pellegrini arriving with President Perez noting “We have to do in one year what we would normally do in three“, an idea that is at odds with the philosophy of the then incumbent in the managerial hot seat. Despite noting that he had begun laying the foundation for success which included dealing with the heavyweights in the dressing room in the shape of Guti and Raul, the Chilean was axed. Pellegrini may only have managed Real Madrid for 48 games but he had a win percentage of 75%, which is 3% higher than a certain Chelsea manager. The words of Guardiola after his Barcelona side claimed the La Liga title on the final day of the season over their arch rivals. Sentiments which were not shared by those inside the Madrid boardroom. When you hear Pellegrini speak, the same themes appear consistently. The need to build, to construct a long term solution and to play aesthetically, but ultimately successful, football in the process. This is not necessarily all out attacking football. It’s considered, it’s patient but it is football with a clear personality. And that really encapsulates his overarching footballing philosophy. Why buy to acquire success if it’s short lived or unsustainable? The creation of a lengthy period of dominance fuelled by both acquisitions and the promotion of youth players from within the club must be the ideal goal. This is what the neighbours from across the city achieved under Ferguson . Players from within being promoted to the first team and supplementing quality acquisitions and it led, after a slow start, to a period of dominance which is arguably unparalleled in the English game. Pellegrini seeks to bring footballers with human qualities to his sides and he too displays the very same qualities he desires in others. Urbane, likeable and fairly laidback, he won’t make great copy for journalists at press conferences as he acts with a professionalism and dignity that doesn’t make headlines. The manner in which he handled the constant sniping and undermining at Real Madrid is testimony to his character, as is the manner in which he has refused to be drawn in ever since whenever his Malaga side has faced los blancos. And now, as he heads for Manchester , Pellegrini retains the same desire to continue building, acknowledging the need for a solution both on and off the pitch. The manner in which some sections of the media questioned City for claiming the need for a “holistic” solution when terminating Mancini’s contract will start to look more questionable by the day. The club have a manager who shares the ideals being espoused at boardroom level. It’s been plain to see where the problems lie in the Manchester City side over the past few seasons. Mancini favoured a very central approach with both wide attacking players operating as inverted wingers. This relied upon the full backs to provide width. The acquisition of Jesus Navas from Sevilla represents a departure from this viewpoint and provides a much needed tactical variation in the side’s attacking play. And just as there have been critics of Pellegrini, there are those who are rushing to criticise Navas. Let’s be clear, the player does have his flaws. He didn’t score a single goal for Sevilla last season and his shooting has always been very poor. But that’s not why you acquire someone like Navas. You acquire him for his blistering pace and very direct nature. His repeated desire to attack the opposition full back on the outside is why you buy him. To stretch opponents defences. His presence on the touchline forces the full back out and creates gaps in a back four. The sort of gaps that a player such as David Silva can exploit. Yet, just as Navas marks a departure for Man City and the players they have acquired, it also represents a change for Pellegrini who has rarely used wingers until he arrived at Malaga and found Joaquin. Once the golden boy of Spanish football, its fair comment to state that Joaquin never reached the heights he should have. Yet under Pellegrini in Andalusia , the winger has been reinvented as a central striker who can pull wide. And Joaquin now plays with the same smile and level of infectiousness last seen during his early days at Real Betis. How Pellegrini uses a player such as Navas will be pivotal if City is to confront their problems from last season and present opponents with new questions. Of course, none of this means Pellegrini will storm the Premiership and help City regain the title from Man Utd. His appointment simply means that the hierarchy have employed an individual who shares their visions and ideals. Progress may not be immediately obvious nor will it be solely assessed by results. Clearly, a disastrous season would have repercussions, but a trophyless season may not. Projects as ambitious as this take time. The club have begun with the acquisitions of Navas and the Brazilian midfielder, Fernandinho. Although Begiristain will be overseeing transfer dealings, Pellegrini will have an input there too as the club build a squad capable of playing the 4-3-3 formation that they have chosen as their default. The plans have been drawn up and the various appointments have been made. It’s time for the Engineer to start building.